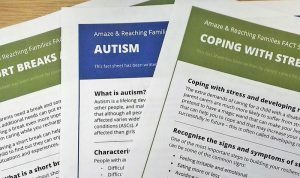 The fact sheets below were co-produced by Amaze and Reaching Families, a West Sussex organisation that supports families of children with special educational needs and disabilities. We drew on the advice and expertise of parent carers to choose the topics covered and to write the content. We now offer some of these fact sheets specifically for families in East Sussex too (see below) and more East Sussex fact sheets will be coming soon. To access versions of these fact sheets specifically for parent carers in West Sussex, visit the Reaching Families website.